This section contains selected PM animations that show how PM patterns change over the course of a given day - as a map of the Bay Area changes color according to the Air Quality Index scale. 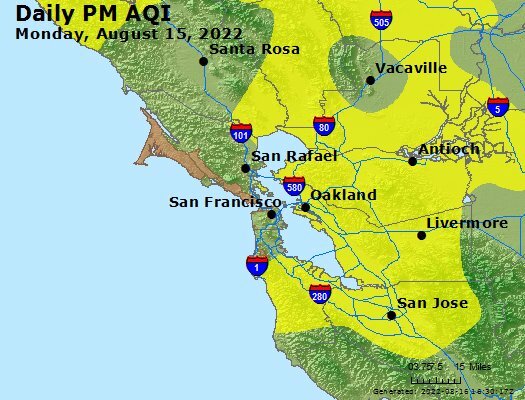 Although the Bay Area is one of the cleanest of the five major urban air basins in California, there are still several days annually when air pollution exceeds the state or federal air quality standards. The links below depict daily particulate matter (PM) development patterns in the region. 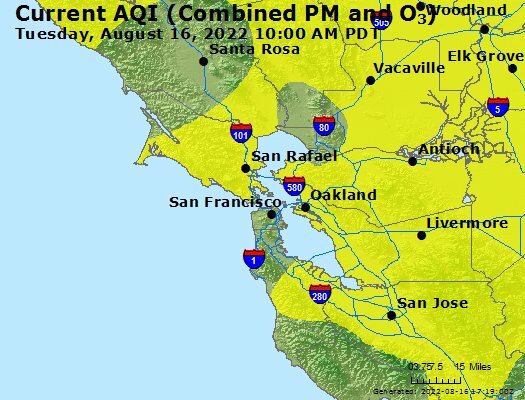 They show how PM patterns change over the course of a given day - as a map of the Bay Area changes color according to the Air Quality Index (or AQI) scale as pollution concentrations increase and subside. Note: Yesterday’s maps are not available until around 9am the following morning.